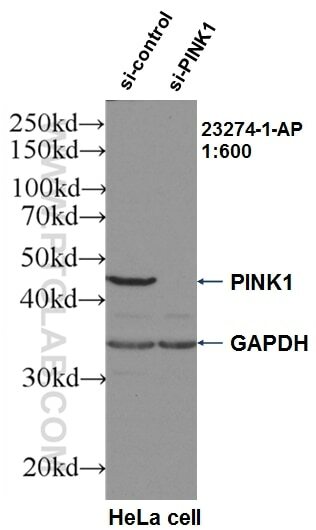 WB result of PINK1 antibody (23274-1-AP, 1:600) with si-Control and si-PINK1 transfected HeLa cells. 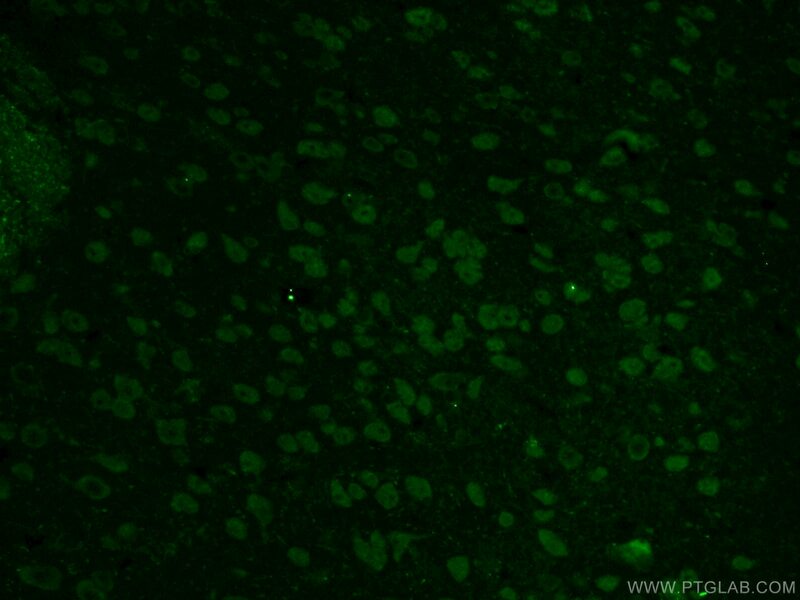 Immunohistochemical analysis of paraffin-embedded human brain tissue slide using 23274-1-AP( PINK1 Antibody) at dilution of 1:50 (under 10x lens). 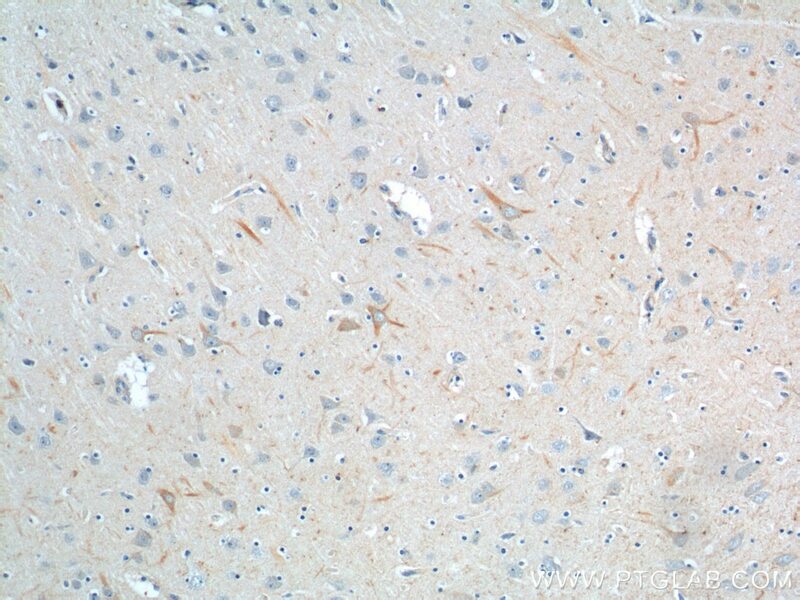 Immunohistochemical analysis of paraffin-embedded human brain tissue slide using 23274-1-AP( PINK1 Antibody) at dilution of 1:50 (under 40x lens). PINK1 is a mitochondrial serine/threonine-protein kinase that protects cells from stress-induced mitochondrial dysfunction. The precursor of PINK1 (65 kDa) is synthesized in the cytosol and is imported into the outer membrane of mitochondria. PINK1 is further transferred into the inner membrane where it is cleaved into a 52 kDa mature form. 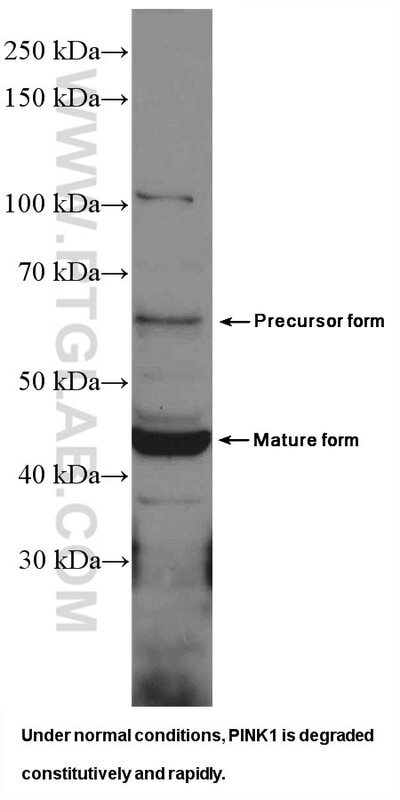 The half life of the mature form of PINK1 is very short and it was proposed that the proteasome is involved in its degradation (PMID: 23472196). The gene of PINK1 maps to chromosome 1p36.12. Two alternatively spliced variants exist, the shorter isoform (30 kDa) produced by alternative splicing. 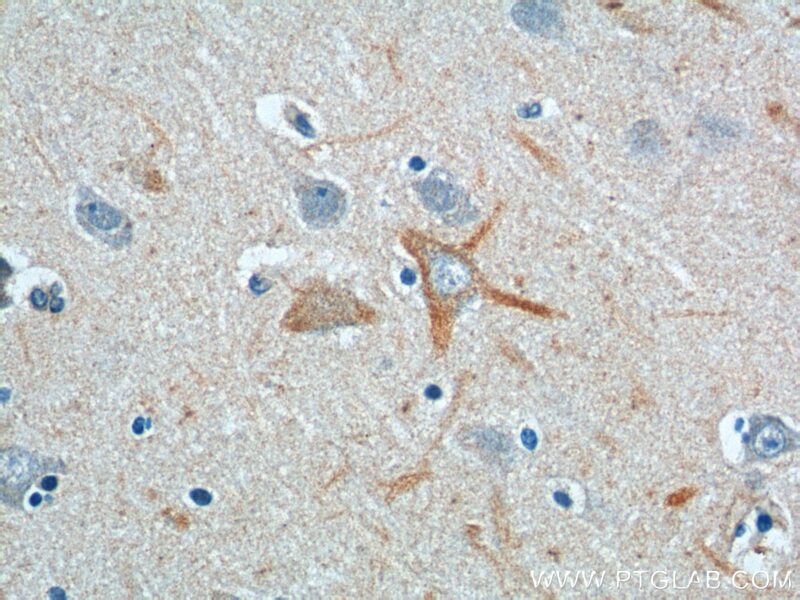 Mutations in the PINK1 gene cause autosomal recessive early-onset Parkinson's disease. Polyubiquitination of apurinic/apyrimidinic endonuclease 1 by Parkin. Involvement of PINK1/Parkin-mediated mitophagy in paraquat- induced apoptosis in human lung epithelial-like A549 cells. Mitophagy Directs Muscle-Adipose Crosstalk to Alleviate Dietary Obesity. Florfenicol-induced Mitochondrial Dysfunction Suppresses Cell Proliferation and Autophagy in Fibroblasts. In mammalian skeletal muscle, phosphorylation of TOMM22 by protein kinase CSNK2/CK2 controls mitophagy.